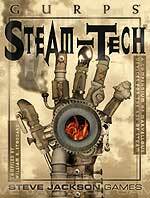 GURPS Steam-Tech, compiled, edited, and partly written by William H. Stoddard, is a sort of gadgeteers' appendix to Stoddard's GURPS Steampunk. If you haven't read that book, or my review of it, I'd suggest you read that review first, for the general background; but this book may be enjoyed independently of others in the GURPS catalog. The Generalized Universal RolePlaying System (GURPS), developed by Steve Jackson Games, consists of "One set of rules that works for all genres." In GURPS Steam-Tech we're given relatively little of the roles and scenarios that go into the role-playing games. Instead we see a wide array of late-Victorian and Edwardian science and pseudo-science; neat gadgets of real or nice-to-have provenance, or perhaps dangerous if your opponent has them; specialized tools and clothing; creatures which are molded one way or another from ordinary creatures or people. A fair number of all these are sticky or explosive or otherwise unsettling even if you (or your character) use or control them yourself. GURPS Steam-Tech resembles notes from brainstorm sessions for some unwritten scientific-romance, fantastic-mystery, or lost-worlds story. Edgar Rice Burroughs or A. Conan Doyle would feel right at home. Even they might not recognize exactly which of the marvelous devices were actually developed, versus those which are leaps of imagination from the science or near-science of the Age of Steam. You may know something of the history and uses of the composition resin bakelite or the lunar crystal artemisite. Stoddard provides a list of Real and Unreal Inventions; but read that after you've read the descriptions. "Hmm... Neanderthal-looking fellow; must be a brute." "Distinguished-looking gentleman; I can trust his advice." "Lovely lady; undoubtedly as sweet as she looks." By compressing the skull in places and pulling on it in others, the phrenological modifier reduces the size of unwanted areas of the brain and allows other, more beneficial areas to expand. And as an all-too-likely tribute to humanity's ability to take a bad idea and organize it officially, we have the Phrenological Career Assessment Office, a branch of the British Government founded in 1847. It's uncertain how closely the government is using phrenological evaluations as aptitude tests; or indeed if "a secret bureau collects all of the reports for some unknown purpose". At least we can relax in our real world, because as we all know, it can't happen here. As in GURPS Steampunk, many inventions are extrapolated from work by great innovators such as Nikola Tesla (electrical) or Charles Babbage (analytical engines). On a more humble scale, it's amazing how many weapons, gadgets, and secret compartments were or could be put into a walking-stick, cane, or umbrella. I've always been fascinated by armored trains and colonial train systems, and there's a good discussion in GURPS Steam-Tech. Some other inventions described that I particularly like include the mesmeric wand; the Tesla pocket lightning projector; the Skoda clockwork carbine; theatrical limelight; aesthetic inoculation; and the wireless field telephone. The autocybernetic servitors remind one of Buster Keaton's great silent film The Electric House (1922). There's a good variety of practical, industrial, and ectoplasmic developments of the luminiferous ether, a scientific idea which came too soon to be properly appreciated. An etherial engine, for beamed power, sounds great; but then there's etheric shock weaponry. Communications may be enhanced by pneumatic, luminary, etheric, or N-ray engineering. GURPS Steam-Tech is filled with black-and-white illustrations which enhance the period flavor. My favorite is that of steam locomotives mounted on mechanical legs rather than driving wheels. A good compilation; fun stuff!